Our mission is to provide you with the service you deserve from the neighbors you trust. We’re proud to be known as one of the last great independent pharmacies in town. You’ll find every member of our staff to be knowledgeable and accessible. Visit us today for all of your pharmaceutical needs. "What can I say? This is like a second home. Flip and Larry have taken care of me for years. You'll feel at home here and can trust you're getting the best professional advice." As the oldest operating drugstore in Hendersonville, NC, we pride ourselves in personalized customer service. 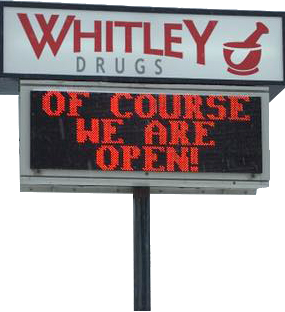 Our pharmacists have been with Whitley Drugs for 15 years and they know our customers by name. Serving Hendersonville, Flat Rock, East Flat Rock, Laurel Park and surrounding areas, we strive to promote health and wellness to our community. Visit us to be greeted by our friendly pharmacists: Flip Fisher, Mike Neal, Jack Romer, and Wendy Yount. We offer services such as medication adherence, medication synchronization, medication therapy management, wound care supplies, mail delivery and private consultation. Our drive-thru window makes it quick and easy to pick up prescriptions, which we always fill in a timely manner.